This article first appeared in The Edge Financial Daily, on July 4, 2018. Most holidaymakers would consider weather as a make-or-break factor of their trip’s success, especially for a beach getaway. The odds were looking unfavourable when I arrived in Thailand to join hundreds of others for The Ritz-Carlton, Koh Samui’s grand opening celebration, which was due to take place later in the evening after an eight-month-long soft launch period. A thunderstorm had descended upon the 58-acre property not long after I had checked in — not that I minded because it gave me more time to take in my elegantly furnished Ocean View Suite. At 1,001 sq ft, which is about the size of a modern four-room flat in Singapore, my abode for the next two nights was one of the 175 villas and suites available on the resort — and of the most modest size, too. Families and large groups of friends may opt for the two- or three-bedroom suites and villas, or even Villa Kasara, which is 2,745 sq ft and comes with three bedrooms, a private swimming pool and a rooftop terrace. Following a candle-lit soak in the tub amid the massive bath area with twin vanities, and several coffees enjoyed on the daybed of the living room’s adjoining terrace, it was time to hail a buggy down to One Rai. Beyond the circular bar and lounge on the second floor where guests were mingling over aperitifs, a multipurpose amphitheatre referred to as Baan Talat was abuzz with preparations for the evening’s activities. The skies had thankfully cleared by then, leaving the air delightfully cool with no trace of bad weather save for the glistening grounds of the resort. He was referring to Francis Yeoh, managing director of YTL Group, which owns a number of Marriott International hotels, including Ritz-Carlton. Following Smith’s gaze, I spotted Yeoh seated with YTL Hotels executive director Mark Yeoh just metres away. YTL Hotels’ portfolio of Marriott International properties currently stands at 11, with five more in the pipeline. While island hoppers may be familiar with the Ritz-Carlton Reserve brand of luxury hotels and resorts, which was introduced to the country in 2008 to target the ultra-affluent, The Ritz-Carlton, Koh Samui, is the first in Thailand to open under The Ritz-Carlton brand. “We are indeed happy to be here. It’s a wonderful event, a wonderful night and a wonderful destination. My predecessor, Simon Cooper, I wish you were here with us today,” continued Smith. “He [Cooper] has not passed away… He has retired,” added the MD quickly as he was met with a wave of laughter. Traditional Thai music by local island performers enlivened the rest of our evening as we feasted on a four-course European-Asian dinner specially designed by the resort’s executive chef. The event concluded with a countdown that culminated in a display of fireworks. While I thoroughly enjoyed the artfully presented dishes by chef Jose Ballester — beginning with a Tataki Trio of yellowfin tuna, amberjack and aguachile and ending perfectly with refreshing Thai Tea Panna Cotta — I found this to be just the icing on the cake upon discovering the resort’s permanent dining options. Breakfast at Shook! is no doubt the highlight of each morning, with an extensive buffet selection of freshly baked European-style pastries, salads, live stations and hot dishes to be enjoyed in a naturally lit interior and at booth tables overlooking the resort and ocean. Should you be visiting over the weekend, opt to remain on resort grounds on Saturday evenings at Baan Talat, where a weekly al fresco dining experience is enhanced with fairy lights and live performances, and the resort’s chefs transform into hawkers for the night to serve up both iconic and lesser-known traditional Thai delicacies cooked street style. At Pak Tai, which serves southern interpretations of Thai cuisine that even purists would approve of, lunch kicked off with a spicy banana blossom salad and miang kham, a traditional appetiser of ingredients wrapped in betel leaves. This was followed by green curry with chicken served with white Jasmine rice; and a colourful rendition of mango sticky rice partially tinted slate blue with dye from the butterfly pea flower. The private dining terraces of Pak Tai are situated just beside a man-made swim reef, which I later dipped my toes into during the 30-minute guided snorkelling experience that followed. Being a non-swimmer, it was a relief to discover that its waters started off shallow at slightly over a metre before gradually getting deeper. 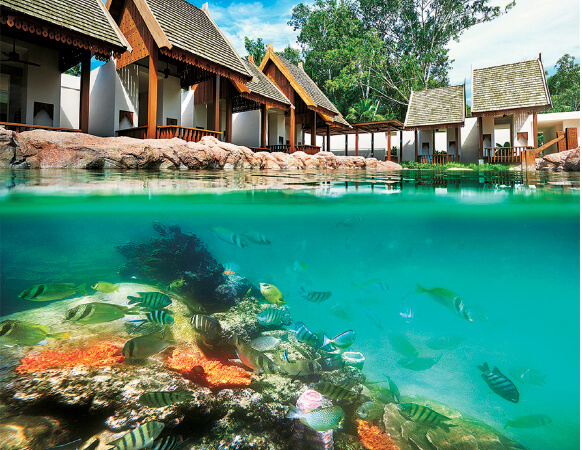 According to our instructor, Sophie, the reef is home to over 50 species of tropical marine fish — many of which were rescued from the local markets and fisheries, and now enjoy temperate, filtered seawater channelled directly from the Andaman Sea. Those who prefer to experience the source itself can opt to take a buggy or walk down either one of the resort’s two private beaches. Here, water enthusiasts can take their pick from kayaking, surfing and sailing activities, just to name a few. Those who prefer to stay on land will find themselves equally spoilt for choice with a yoga pavilion and tennis court among the facilities available for recreation. There is also a purpose-built Muay Thai ring where classes are conducted regularly. The days that followed The Ritz-Carlton, Koh Samui’s grand opening were warm and sunny without a smidge of rain, which beachgoers would enjoy. Yet, for homebodies such as myself, the sheer space of my luxuriously appointed room with its king bed, sweeping views of the great outdoors through floor-to-ceiling windows, and two LCD television sets with a range of satellite channels were more than enough to keep me occupied for hours, rain or shine.